100 FREE or inexpensive & fun alcohol & drug-free local activities! 2. Look for agates on the north side of Bear Trap. 3. Look for Hyalite opals on the tops of the mountains around Squaw Creek. (Yes, there are spots you can find them away from Hyalite Lake.) To gather rocks on national forest land you need a permit, which can be obtained yearly at the Ranger Station on Huffine Lane. 4. Find and eat huckleberries up in the mountains (August). 6. Fish the Gallatin or other rivers. 13. Visit the second floor of the Courthouse on Main and check out the funky display of rocks, fossils, artifacts and history. 14. Feed the ducks in MSU’s duck pond. 15. See what dances & concerts the Bozeman Folklore Society is hosting. 17. Try the lunch special at a new restaurant every week. 18. Try rollerblading or dancing with roller skates on. 19. Volunteer for CAP or Big Brothers Big Sisters. Make a kid feel special. 20. See a movie at MSU’s Procrastinator Theater or the Bozeman Film Festival, held at the Emerson. 21. Get a cookbook and learn how to bake bread. (Second hand stores often have used bread bakers). 22. Call Befrienders or the Senior Center for volunteer opportunities. 23. Walk a dog or pet a cat at Heart of the Valley. 26. In Bozeman, swim a few laps in the city pool every day. 27. Drive down to West Yellowstone and view the canyon before Big Sky and the wildlife south of Big Sky. Watch for moose, grizzlies and wolves. 28. Go to West Yellowstone in the winter and cross country ski on the Rendezvous trail. Bike it in the summer. 29. Visit Mammoth Hot Springs in the winter after snow falls. Bring cross country skis or snow shoes, or rent them right in Gardiner or Mammoth. 30. Do a “Trading Spaces” using finds from thrift stores or yard sales. 31. Head up in the mountains away from the valley lights, lie on the grass and look at the stars. 32. Watch the full moon rise over the mountains. (Check out StarDate for celestial events). Or go on a full moon walk or ski (sometimes the The Montana Wilderness Association hosts these). 33. Go Dancing at Townshend’s Tea House or visit this website for other opportunities. No partner needed! 34. Attend the ballet, or the symphony. Can’t afford it? See if they need volunteer ushers. 35. See a play, on or off campus. There are loads of small theater companies in the Gallatin Valley. 36. Get a map of Bozeman and visit each park. 37. Learn about earthquakes in Montana. 38. Attend alcohol-free concerts at places like Bozeman’s Wild Joe’s Coffee House or the Community Food Co-op. 39. Float the Madison River. 40. Join or start a book club. Check what’s available through your Public Library. 41. Have a water balloon fight with friends. 42. Attend a lecture at MSU or the Museum of the Rockies. 44. Hike Palisade Falls, a short, paved walk in the Hyalite Reservoir area that is handicapped accessible. This gentle, half-mile trail leads to a towering waterfall surrounded by deep woods. Take South 19th Av to Hyalite Canyon Road. When you reach the reservoir, cross the dam and follow the dirt road to the Palisade Falls Trailhead parking lot. 45. Hike Grotto Falls, also in Hyalite Canyon. It’s about a mile walk along an easy, gradual grade that leads to the falls. On Hyalite Canyon Road, instead of going right, follow the Y in the road to the left and park. For those more adventurous, continue following the trail past Grotto Falls for a total of 7.5 miles to Hyalite Peak. It’s a fairly easy climb until the last few miles, which are a steep climb. 46. West Shore Trail. Also in Hyalite Canyon, this 3.5 mile trail starts at Hyalite Reservoir, goes up to Crescent Lake and loops back around to the parking lot. An easy, entirely gradual if any uphill jaunt. 47. The M. One of Bozeman’s most visible landmarks. There are two mile-long trails to the landmark, one with winding switchbacks and the other a rigorously steep trek for the more ambitious. Baldy and other peaks of the Bridger Ridge can be reached by continuing above the M. The extended, rigorous hike takes a few hours, but the views of Bozeman Bridger Canyon and the Gallatin Valley are dramatic. 48. Sacajawea Peak: The tallest peak in the Bridger range is summited with a steep, two-mile climb that starts at the Fairy Lake Campground. Bridger Canyon Drive for about 20 miles, past the Bridger Bowl ski area. Turn left on the Fairy Lake access road and bump along the dirt road for about 8 more miles. Follow the clearly marked trail up to the spine of the Bridgers – to the south is the 9,670 foot Sacajawea and to the north is the 9,561 foot Hardscrabble Peak. 49. Lava Lake: A beautiful mountain lake in the Spanish Peaks. Head south from on Highway 191 toward Big Sky and look for the Lava Lake parking lot to the right in Gallatin Canyon. The turnoff is just before a bridge crossing the Gallatin River. The 3.5 mile hike follows Cascade Creek through thick woods, past a waterfall or two and up occasional steep stretches. You emerge from the woods at a small lake that can be covered in ice until the middle of summer but is great fishing. 50. South fork of the Spanish Creek: Take Highway 191 south, turn right onto Spanish Creek Road and head through Ted Turner’s property until you hit pavement and the Forest Service parking lot. From there, start out on a fairly flat trail for about 3 miles until you reach the Falls Creek trail. Take Falls Creek trail to Pioneer Falls. This climb, like many others in the area, starts out easy and gains difficulty with elevation. 52. Mount Blackmore: hike to one of the highest peaks in the Hyalite Peaks. Take South 19th to Hyalite Canyon, drive the canyon and park at the trailhead at the north end of Hyalite Reservoir. The 5 mile trail leads south and upward, past Blackmore Lake and then climbs to the 10,154 foot Mount Blackmore, which offers commanding views. 53. Big Horn Peak: A long, scenic hike in Yellowstone Park. Drive to the park’s northwest corner. Look for the Black Butte trailhead by the highway and leave your car in the nearby parking lot. The well-marked, 7 mile hike winds through a wooded valley, then climbs steeply to the ridge that marks the park boundary and 9,930 foot Big Horn Peak. This is a chance to see moose and bighorn sheep. Watch out for bears. 54. Go water skiing or floating in an inner tube. 55. Work out (run, walk, lift weights). You can pay for a guest pass to most local health clubs. Try them all! 56. Play croquet. Just setting up the course will keep you busy for awhile. Make it fun, like miniature golf. 57. Play frisbee golf at Rose Park in Bozeman. Also try Battle Ridge or Bohart Ranch. Here’s more information. 58. Check out the local baseball and soft ball leagues. 59. Start a three on three basketball tournament. 60. Visit Bozeman’s American Computer Museum. written word. Sit in a comfy chair and browse magazines. photo tips are available on the website for Bozeman’s F11 Photographic Supplies or try their Glass House Photography Group for just $5 a meeting. 63. Take a class at Quilting in the Country on South 19th Ave, toward Highlight. 64. Help out with carpentry projects. Call Habitat for Humanity and volunteer. 65. Grow a garden. (For area Community gardens, contact the City of Bozeman). 66. Play a musical instrument. Music Villa offers rentals. 67. Learn to crochet or knit — Bozeman stores often loads of classes as well as free project nights. Get social and make cool stuff, all at one time. 70. Design or tie-dye t-shirts. 71. Write a song, story or poem. activities and morning pages journaling. 73. Help at the Gallatin Valley Food Bank, Salvation Army, or Soup Kitchen. 74. Visit the elderly at a nursing home (especially around the holidays). 75. Pick a new area of town to explore each weekend. 76. Try a new place for coffee (or tea!) each week. 77. Bake a cake from scratch, or make a gourmet dinner for you and your friends. 78. Take dance lessons. Attend monthly Contra or weekly International folk-dancing. Check out the schedule on the Bozeman Folklore Society website. 79. Go sailing, or canoeing, or sunbathe at the Bozeman Beach. In winter, cross-country ski the linear trail there. 80. Learn a foreign language (check out Bozeman Community Education or Alliance Francais in Bozeman’s Emerson Cultural Center for classes). 81. Ride the Gondola at Big Sky Ski Resort. 82. Participate in a local run or triathlon. 83. Become involved with students from a foreign country to learn about their culture. Attend MSU’s International Foodfest in February, or the Pow-wow in the spring. 84. Tour local police/fire stations, or the Gibson Guitar company in Bozeman. 86. Try out free-style or Chi-Walking. 87. Look at antique or second-hand stores in rural communities like Belgrade, Three Forks, or Livingston. 88. Search back in Bozeman’s Library’s archives to see what Bozeman looked like in past years and learn about local history. 89. Try a Yoga, Pilates, aerobics or Tai Chi class. There’s an incredible variety of them locally. Learn to meditate. 90. June thru August join in for the Friday Evening Campground Programs hosted at the Lewis & Clark Caverns State Park Campground Amphitheater. Different presenters each week and times do vary. Call (406) 287-3541 for information or to receive the summer’s schedule. 91. Enroll in a free, virtual Eco-Psychology or Reconnecting with Nature course offered by the Institute of Global Education. Learn along with folks from all over the world. De-stress. Connect. 92. 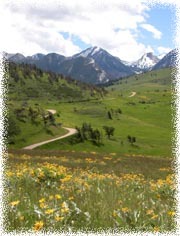 Join The Montana Wilderness Association for a hike. 93. View art exhibits at Bozeman’s Emerson Cultural Center. 94. Stroll Downtown Bozeman on the summer, once-a-month Friday Night Art Walk (summers). Or on any Friday night or Sunday morning. 95. Attend a summer performance of Montana Shakespeare in the Parks. 96. Perfect your grind at the Bozeman Skate Park or visit the BMX track. 97. Learn how your government works. Attend a county or city commission meeting. 99. Visit the Bogart Park or Gallatin County Fairgrounds’ summer Farmer’s Market for a “happening” local event. Try the Emerson’s Winter Farmer’s Market too.